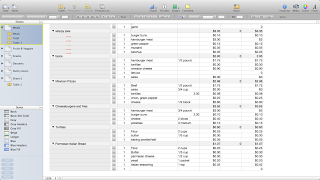 So I have been using a grocery and meals spreadsheet. It is custom for my shopping and meal preferences. It is a big help though. Now I can check off what I would like to get from the store and KNOW what I’m going to spend…as long as I stick to my list 🙂 Each time I go shopping and buy stuff not on my current list, I just keep the receipt and go home to enter it in so I have a record of it. 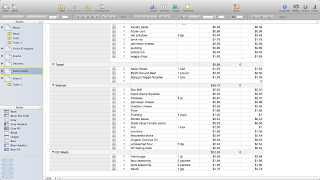 Here’s some screen shots of what my spreadsheets look like (click on the picture for closer view). For meals I just divide the cost of what I use out of it for the meal (2 cups flour, figure out how much it costs out of the whole bag). Then it totals up to how much the meal costs. I like to just put in what the regular price of items are and if they’re on sale then it’s a bonus. That way I have allotted enough money for shopping trips and budget the right amount of money without expecting the sale price. So whatever I can get on sale is great cause I’ll have extra money (end goal). Plus, if you’re short on money for a week, you can figure out what meals cost you the least to make and go buy those. I hope this helps motivate you to do your own! 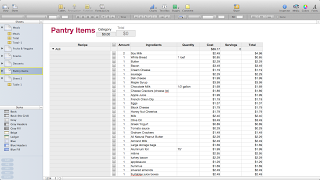 There are some formulas involved that I’m not so sure about because my BIL did the spreadsheet but you can do a simpler one without check boxes and just total up everything if you’d like. 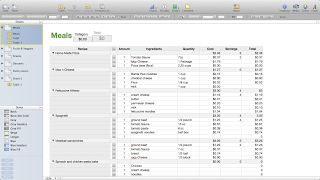 Happy budgeting and planning!